Statistics show that many Americans are downsizing to a smaller home each and every day. This is due to the fact that living in a Tiny House is much simpler and affordable. With the housing market not being like it used to be, homeowners have realized that investing all of their money into their home may not be the best option. A tiny home is the next best thing. 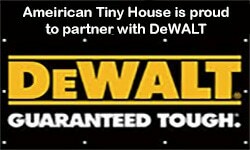 At American Tiny House, we provide custom homes that provide the occupant with the essentials. Our custom homes will not only provide you with what you need but save you a significant amount of money. For more information, contact us at (903)930-8500.